I know it’s a bit presumptious of me to give advice to homeless people asking passersby for money, but I’m going to give it a go. I might give this guy a quarter, but beer? Not sure. I sympathize, as anyone can fall on hard times. I might end up in a bad place someday, asking for change on a street, so I shouldn’t be cruel. But even when you’re asking people for spare change, you need to do your marketing right. But I still think this guy has the wrong approach. When people want to help, they want to make it easy. Unfair, I know, but there you go. Really, just ask for money. Also, I don’t know, people might think of beer as a bit of a frivolous luxury for someone who needs food and shelter. Another guy asking for money last week was also a bit too specific. “Do you have $1.34,?’ he asked me. Yes, I did, but I declined. Who wants to count out change all day? Yet another tip for the homeless: Consider how you dress. I know that’s an elitist thing to say. If you’re poor, you don’t have a lot of fashion choices. So whatever you’ve got on your back is fine. I just wondered if the overweight guy asking for change on Burlington’s Main Street the other day while wearing pink pajama bottoms would have done better if he somehow found something else to wear. Of course, the more basic question is, should anyone give money to people on the street, no matter how needy they seem? And how should you treat the guy who asks you for money? Ignore him? Say something? I always struggle with these. The consensus among advocates seems to be don’t give them money. If they’re hungry, go ahead and buy them a sandwich. If they’re thirsty, get them some juice. He looks cold? Give him something to wear. Just don’t give money, we’re told. Many, but not advocates say that if you give them change, chances are you’re feeding an addiction to drugs, alcohol, or just cigarettes. But still. 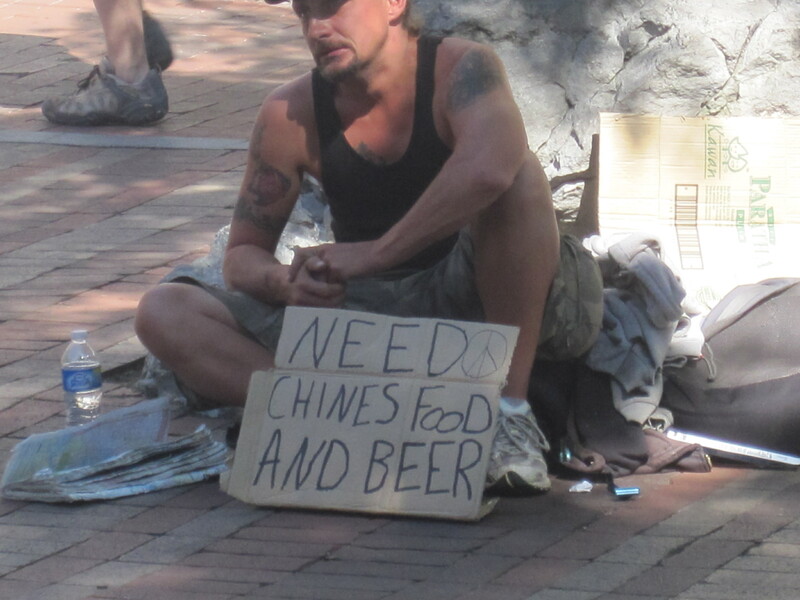 Advocates say it is rude to ignore the panhandler. I guess that’s right. They probably feel bad enough panhandling without everybody pretending they don’t exist. I admit I sometimes ignore them because I feel uncomfortable not giving them change. I guess the right approach is “Sorry, not today,” then move on. Luckily, Burlington has an excellent organization, Committee on Temporary Shelter, which does great work for the homeless. COTS really seems to know what it’s doing, so if you want to help the homeless, maybe throw them a few bucks. This entry was posted on August 28, 2010 at 10:42 am and is filed under Uncategorized. You can follow any responses to this entry through the RSS 2.0 feed. You can leave a response, or trackback from your own site.